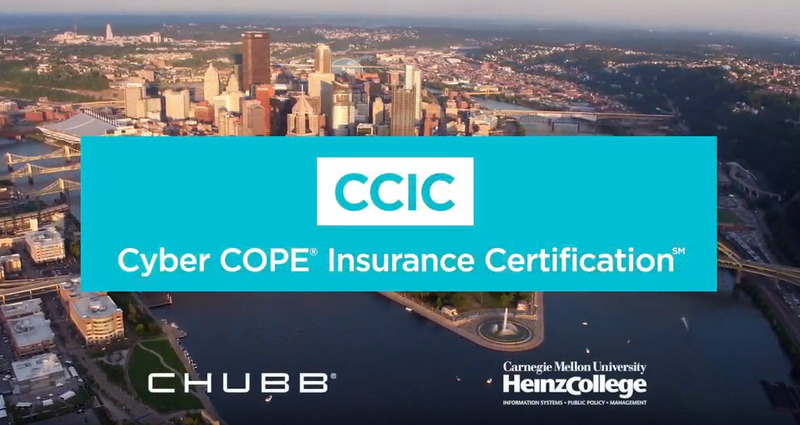 The Cyber COPE Insurance Certification℠ (CCIC) provides Chubb brokers and agents with an understanding of industry best practices in cyber security risk management, governance and operations. In this program students will learn what high-performing advisors need to know in order to thrive in their roles, including how to interact with executive leadership of potential customers, how to provide analysis and support in effective cyber risk management, and approaches for building and maintaining strong relationships with prospective cyber risk insurance clients. The eight-month program imparts applicable training, including topical discussions on current cyber security risk challenges and mitigation practices. Learning objectives are met through a combination of expert faculty instruction, business case analyses, and discussions with thought leaders in the field. The CCIC is developed and delivered by Chubb and Carnegie Mellon University’s Heinz College of Policy & Information Systems. The 2019 application period is open. Dedicated cyber insurance agents, brokers and wholesalers across North America that are strong partners of Chubb with a focus on cyber insurance. This eight-month program consists of three residential sessions located at the prestigious Carnegie Mellon University and Silicon Valley, CA, a series of virtual learning modules and a Capstone project. As part of this certification, students will develop an engagement strategy and a custom solution for a chosen organization. This engagement strategy and plan is designed to allow students to apply several of the methods, tools, and techniques taught during the program. Participate in the virtual classroom sessions held on Wednesdays. It is required that you attend 75% of the CCIC virtual sessions live. Missed sessions to be made-up by viewing recording of virtual session. Complete a Capstone Project, including adhering to project milestone deadlines, which addresses a business challenge or opportunity in your agency. To maintain the designation, participants are required to attend two virtual sessions each year. For consideration to attend the CCIC program, candidates must apply using an online application. Participants will be notified of their acceptance. Residential modules for this program will be held at the Carnegie Mellon University Pittsburgh, PA campus and in Silicon Valley, CA. Travel to both locations is required. Virtual training attendance is also required. The CCIC is an eight month program. A minimum 14 day notice is required to guarantee a full refund. Please send cancellation requests to agency_education@chubb.com. Include “Program Cancellation Request” in the subject line, and your original registration information in the message body along with the reason for the cancellation. $5,000, which includes all classroom and virtual instruction. Travel and accommodations for the residential modules are the additional responsibility of the participant. Submit your application for the 2019 Cyber COPE Insurance Certification (CCIC) program. Applicants will be notified of their approval status prior to acceptance. Which Chubb branch office are you affiliated with? * Albany	Atlanta	Austin	Baltimore	Birmingham	Boston	Charlotte	Chicago	Cincinnati	Cleveland	Columbus	Dallas	Denver	Des Moines	Grand Rapids	Harrisburg	Houston	Illinois – Schaumburg	Indianapolis	Kansas City	Long Island – Uniondale	Los Angeles	Louisville	Michigan	Milwaukee	Minneapolis	Nashville	New Haven	New York	Newport Beach	NJ Retail	Philadelphia	Phoenix	Pittsburgh	Portland	Richmond	Rochester	San Diego	San Francisco	San Ramon	Seattle	St. Louis	Tampa	Tulsa	Washington DC	Westchester – White Plains	Other	New Option	 Which Chubb branch office are you affiliated with?